NSP 06 E-Plus Fun Mini-Mal Surfboard. Fun shape to begin and progress your surfing. Super durable. Check our range of Surfboards Online NOW! 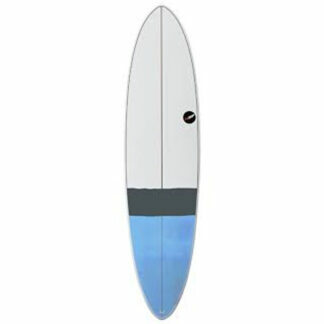 The NSP 06 E-Plus Fun Mini-Mal Surfboard is all about fun. It’s just the right size so you’ll rapidly progress your surfing. Not too long, heavy and unwieldy like a longboard. Not too hard to paddle and catch waves like a shortboard. The mini-mal design has a mid rocker so you can catch waves easily and do turns easily. 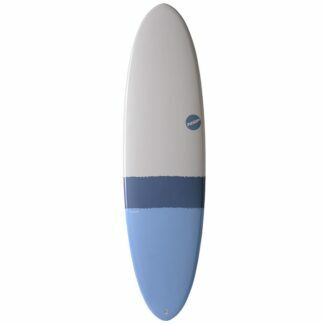 The fuller nose makes for easier paddling and added momentum so helping get onto waves. Once on the wave you can turn and trim like a longboard, getting speed down the line. You get forgiveness with soft and tucked under rails. This helps you pass through chop and bumps without catching. The tail finishes with a classic rounded pin so you get stability and hold. An FCS Original 3 fin plug system is included. In this way you’ll be able to change the performance of the board. You can use different fins and fin combinations. So you’ll have the right setup for different conditions, small or big days. Construction is of NSP’s high technology. E-Plus is NSP’s extra strong materials with military grade fibreglass. NSP claim eco-friendly vacuum moulding around a foam core and the epoxy outer has a range of finishes. The deck is matt-finished so you get more traction and easy waxing. The bottom has a performance speed-finish. 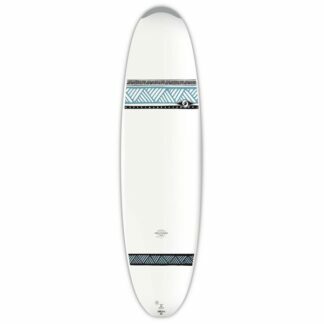 The NSP 06 Elements HDT Fun Mini-Mal Surfboard is perfect to start and progress your surfing in a durable high tech fun package.